Not too many cases that U.S. Air Force UFO investigators acknowledged of being baffled, and one of those few involved a UFO incident in 1964. Witnessed by a police officer, a mysterious object was seen close to the ground outside of Socorro, New Mexico. 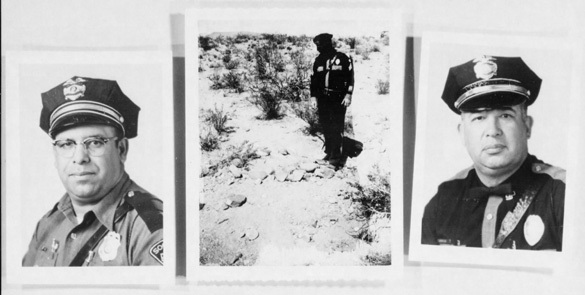 Lonnie Zamora, Socorro police officer, was pursuing a speeder just south of town 50 years ago, on April 24, 1964 at 5:45 pm. He reportedly heard a roar from a distant and decided to quit his pursuit of a speeding vehicle and went to a place where he heard a loud sound. He knew there was a nearby dynamite shack, so he suspected that was the source of the noise. Moments later, while going towards the scene, he saw a flame in the sky. He described it as a bluish orange that seemed to descend, but he did not fully focus on it because he was driving and paying attention to the steep part of the road. When he reached the top hill, he saw white object landed on the ground out in the desert. He also noticed two of what he thought as people. He described the object as oval with white color. The object also appeared to be on two legs. A car wreck came to his mind, so he immediately went down the road to offer help. He informed the dispatch about his activity and that he would be assisting a car wreck. When he reached near the object, he pulled over his car and radioed to the dispatch that he was leaving his car and then got out. Just seconds later, he heard a very loud roar and then saw the object started to elevate with a blue flame under it. He observed that the bottom of the flame appeared to be orange. He also saw a smooth look of the object, which without any windows and had an insignia on the side. Anticipating of possible of explosion, he ran around his car, but he fell down when his leg hit the fender. He glanced back at the object and saw it rising with an increasing noise of the road. Because of fear, Zamora got up and ran away from the object and eventually jumped over the hill to take a cover. He was planning to move a little bit more, but the sound stopped. When he looked back at the object, it was already moving away at approximately 10 to 15 feet from the ground. It passed over the dynamite shack and followed the contour of the land at an altitude not higher than 20 feet until Zamora could no longer see it. Zamora immediately got back to his service vehicle and contacted radio operator, whom he asked to look out the window to see if he could spot the object. However, the dispatcher failed to see it. Police officer of New Mexico State Sergeant Chavez then arrived on the scene. Chavez asked Zamora about the incident, who was out of breath and pale that time. Zamora told him the entire story, and they investigated the landing spot. When they reached the area, they both saw a burnt bush and impressions on the ground, which could have been the results of the landing gear. 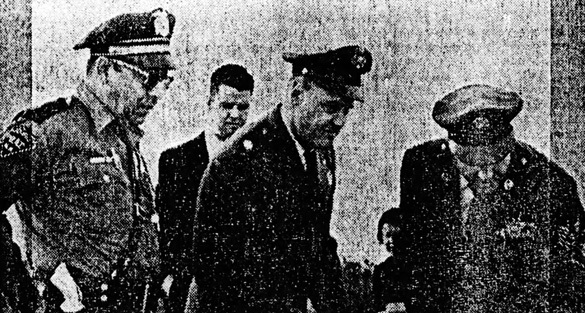 Local newspapers picked up Zamora’s sighting and caught the attention of Project Blue Book, a group created by the U.S. Air Force to investigate UFOs. Investigators were impressed with the credibility of Zamora and the physical evidence, though nothing was found unusual on a burnt branch from the bush and the soil at the scene after analyzing. Radiation levels were also normal. Investigators found a burnt cardboard on the site, but Dr. J. Allen Hynek, the scientific investigator of Blue Book, said that it was old and probably blown by the wind from under a bush. Investigators also found no tracks from vehicles going into the area, which supported the idea that the event was not staged or not a hoax. Despite comprehensive effort to explain the fact, investigators did not know what Zamora had witnessed. They thought that it could be an experimental craft because White Sands Missile Range was very close to the scene. They even suggested that the object could be a Lunar Excursion Module (LEM), similar to what Apollo program had used. However, there’s no definite answer after investigating these possibilities. Hector Quintanilla, director of Blue Book Project, said the police officer witness is puzzled by what he witnessed and frankly, so they are. He noted that the report is the best-documented case on record, and it remains a mystery despite comprehensive and thorough investigation to find the object or another stimulus that brought extreme fear and panic on Zamora. Map of the White Sands Missile Range. This case still occasionally featured in the news and continued to be essential in the field of UFO research. Many have said it was a hoax but failed to produce anything definitive. A professor from New Mexico Tech said they thought somebody hoaxed it, but they did not provide substantial explanation to support their theory. The town of Socorro provided a memorial to Zamora’s UFO sighting through a mural, which is several hundred yards from the actual landing scene. Zamora’s experience still a mystery fifty years after and likely to continue getting interest fifty years from now.